Nancy: A. B. Vannoy Hams was established by Burl Vannoy in the 1930’s. The ham plant is located in West Jefferson, NC in the heart of the Blue Ridge Mountains. Burl and his wife Virginia lived in the little red brick house right next door to the ham plant. In those days when folks wanted to buy a ham, they would knock on the Vannoys’ front door. They had no retail store, and business was conducted at home among friends and neighbors. Back in the day as many as seven country ham businesses flourished here in Ashe County, but the A. B. Vannoy ham plant is the only one that is still in operation. GA! : Tell us a little about you and Byron, and how you guys come to be part of the Vannoy Ham story? Nancy: After Burl Vannoy died in the 1970’s, one of his daughters kept the business going until she decided to sell the business and retire in 1994. 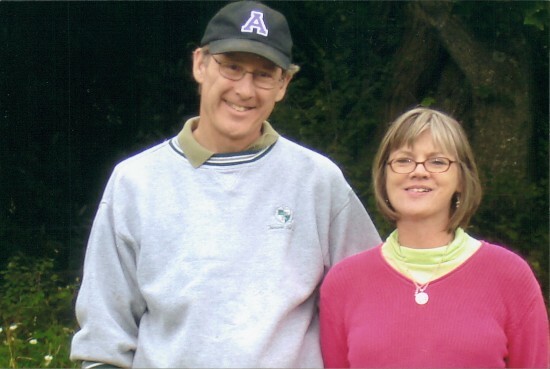 My husband Byron and I bought the business from the Vannoy family. We already owned a barbecue restaurant and were familiar with dealing with food, but we had to learn the Vannoy ham curing process from scratch. From the outset we adopted the business philosophy ‘If it ain’t broke, don’t fix it.’ We have not altered or changed one thing and continue to cure hams exactly the way Mr. Vannoy did many years ago. GA! : What is the difference in a “quick cured” ham like most are today, and the traditional 9 month old fashioned process that you use? Nancy: The quick cured country ham is the predominant type of country ham in the marketplace today. They are mass produced and sold in huge quantities to grocery stores, chain restaurants, and other places. Actually there are many similiarites between quick cured and climate cured country hams, but there are some distinct differences that set the two products apart. Both styles are required to follow the ham curing regulations and guidelines established by the USDA. First of all, while both types of curing involve subjecting a ham to cure mix, the quick curing plants may inject their hams with a saline solution to ensure that the salt gets to the bone. The Vannoy ham is never injected with needles. A quick cured ham is placed into and cures out in a temperature controlled room that may reach 90 degrees. 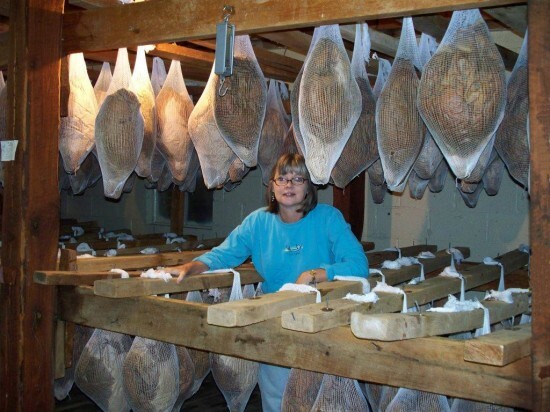 The Vannoy ham is hung on drying beams and dries by means of climatic conditions determined by the outside weather. The quick curing ham plants can receive hams any time of the year. Their entire cyle lasts about ninety days. The Vannoy ham plant can only receive hams in between Dec.,15th and Feb 13th, and the hams are required to be in the drying rooms during the months of June, July and August. They cannot be released for sale before Sept 1st.. Finally, all the quick curing plants use chemical preservatives such as sodium nitrates and nitrites on their hams. The only preservative used on the Vannoy ham is salt. These are the primary differences between a quick cured ham and a climate cured ham such as ours. GA! : So the hams really are hand crafted, in that a lot of personal attention and care go into each ham? Nancy: Absolutely. Out of necessity as well as out of a desire to produce a high quality product, every ham is handled many times during the curing process-actually each individual ham goes through at least 13 different steps; from the time it’s unloaded off the truck, until it’s placed in customer’s hands or shipping box. Handcrafted is definitely the operative word. No ham ever leaves our plant without a lot of TLC. GA! : What happens to a ham form the time it comes in your door, until the time it leaves? Nancy: Each ham undergoes a mysterious transformation which is part science, part Mother Nature. When the ham arrives, it is white and pink in color. Curing is synonymous with drying. As each ham “takes the salt,” it begins to lose moisture bit by bit and become dryer. Gradually the ham changes color and consistency. As the meat gets firmer week after week, it changes color from pink to red and finally to brown. The salt acts as a natural preservative which kills bacteria; the brown sugar balances the salt and adds a touch of sweetness. The entire cycle has a certain mystique, but it is a cycle that is both predictable and reliable. For over seventy-years, the process has worked, year after year, ham after ham. GA! : I know your hams are available at Smoky Mtn. BBQ in West Jefferson that you guys also own- lunch was off the chain! I have to say the county ham and ribs were ridiculously good! Nancy: Thank you and I’m glad that you enjoyed your lunch. The building where we cure our hams is just an old building, and it is not set up for retail sales. We don’t have a cash register here or credit card machine. Therefore, we retail all of our hams products over at Smoky Mountain Barbecue, which is our second business. Folks can go in over there, have a nice meal, and buy their ham all in one visit. GA! : Is it true that you guys sell out of hams every year-how many do you make or cure? Nancy: We order approximately 2,000 hams every January to be cured out and ready for sale by Sept 1st. Our first boost in sales occurs in the autumn after the new hams are ready. We sell a fair amount for the Thanksgiving holiday, but by far our biggest sales occur at Christmas. We often run out of inventory by spring or summer, but we always have plenty of inventory for Christmas gift giving. Nancy: Prosciutto is the Italian word for ham. It is dry cured ham which is thin-sliced, so thin it is almost transparent. It is served uncooked, and can be eaten right out of the package. After being in the ham curing business for several years, my husband and I were approached by customers visiting our area from New York, Chicago, and Miami. They described getting “old” ham in these cities which could be sliced and eaten right off the bone without cooking. These “old” hams were at least one year old. Our prosciutto simply comes from our regular hams which have been allowed to hang and dry for one or two years. Now the cadilac of prosciutto are the Italian hams and Spanish Iberia hams which are quite costly because they are derived from a special breed of pigs which are fed an exclusive diet of acorns. While we do not go to such extreme measures to make our own prosciutto, our prosciutto customers seem to love it. We sell it in 4 ounce packages, and it can be used in appetizers, entrees, and even pizza. Prosciutto is our newest product, and it is growing fast. GA! : I know you can buy whole hams that require some preparation, but you also sell gift boxes, is that right? Nancy: Yes, whole hams and half hams require preparation before cooking which may include soaking, marinating, and skinning. Our vacuum sealed products are designed for ease and convenience. Our gift box includes three vacuum sealed packages of sliced center/biscuit cuts, plus a small package of seasoning chunks. The slices are trimmed and deboned and require little preparation and minimal cooking. The gift box is one of our most popular items at Christmas. GA! 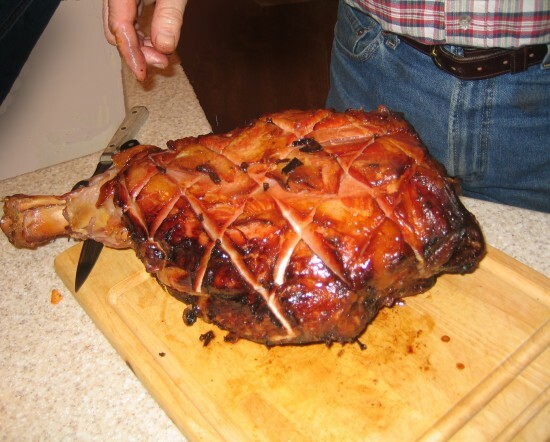 : Why do you think folks love your ham so much? Nancy: In an age of instant gratification with texting, tweeting, e-mail, and cell phones, our customers seem to appreciate the fact that we still engage in an antiquated process that dates back to a simpler time and an era of innocence. We don’t rush the process and we don’t take shortcuts. We are committed to carrying out the tradition of Mr. Vannoy’s style of old fashioned ham curing without any modernization. In doing so, we are honoring an art form, which unfortunately, is sadly dying out. Also, our customers come back time and again because the Vannoy ham has a signature flavor. Two comments we constantly hear are “Hey, your hams don’t taste salty at all,” and “Your hams remind me of the ham my granddaddy used to cure.” Mr. Vannoy used to say that his hams were cured with four simple ingredients: salt, brown sugar, fresh mountain air, and time. It’s the perfect combination of those ingredients which make the Vannoy ham stand out from the rest. 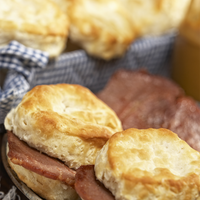 A true country ham connoisseur knows the difference and can taste the difference between a quick cured ham and our ham. In a word, it’s the flavor. Nancy: Every January our new fresh hams arrive in a tractor trailer truck from a pork producer. They arrive packed in shrink wrapped boxes and have to be unpacked and unloaded one ham at a time. The month of January occurs in the the heart of wintry weather here in the mountains. Sometimes it’s snowing and flurrying accompanied by strong, blustery winds on that day, and our workers have to be bundled in multiple layers to withstand the cold. It’s always a long, grueling, cold day. I’m convinced there has to be a special place in heaven for the small business owner. GA! : What if I have questions about hams or gift boxes, or prosciutto? Nancy: You can order 2 ways: you can go to our website www.abvannoyhams. com and order from our online store. If you have questions about a product shown or are interested in a product that is not there, you can e-mail at abvannoyhams@skybest.com and I will answer your questions. Or you can call us on the telephone at 336-246-3319 and/or ask questions and place your order then. GA! : Do you give tours of your facility? Nancy: We are happy to show folks our plant and give the history and the way we do things. However, our ham building is really like an old barn and is not conducive to public access. Like a barn we don’t have any heat or air conditioning, and we have 2 narrow cramped staircases. If people really want to see our old facility, we ask that they call ahead at 336-246-3319 and make an appointment. Please don’t show up without calling first. GA! : What is the funniest or most unusual or unexpected thing to happen to you in the ham business? Nancy: Right off the bat Byron and I had to learn very quickly that country ham is a product that is exclusive to the South. People in the North, West, and Midwest are not familiar with a country ham and generally have no idea what it is and how to cook it. During the Christmas season, sometimes one of our regular customers will ask us to ship a ham as a gift to one of their friends or relatives who live outside of the South. Now every good Southerner worth his salt knows that mold growing on a country ham is common and is completely harmless (just like some cheeses). The mold grows on the outer skin and does not touch the meat inside. All you have to do is simply wash it off, that simple. When we sell a whole ham, it is enclosed in a nice cotton sale bag with a tag attached to the nylon rope at top. The tag has some basic information and instructions about the ham. The tag mentions the possible appearance of mold and simply advises the customer to wash it off. More times than we like to count, someone “not from around here” will receive one of our hams as a gift. He neglects to read the information on the tag, opens the ham, spies the mold, assumes that the ham is spoiled, and throws the ham away. We usually get the phone call AFTER the ham has gone in the trash, not before. The caller feels it is his duty to inform us that the product was bad and usually expects to be congratulated for throwing away a spoiled product. When I hear that one of our hams has been thrown away – after all the money, time, labor, and investment – for something as minor as mold- I just want to sit on the floor and cry. This is definitely not funny, but something unexpected we’ve experienced more than once in nineteen years of ham curing.